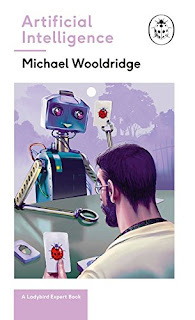 Michael Wooldridge takes us on an effective little tour of artificial intelligence. 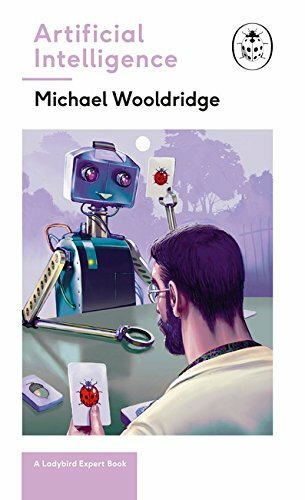 Given the very compact form, he fits a lot in, taking us through some of the historical development including the 'golden age' (when everything seemed possible and very little was done), through the rise and fall of expert system, robotics, and the modern split between machine learning and 'good old-fashioned AI'. He emphasises how much in the past expectations have far outreached reality (then does something rather similar himself at the end). It's just such a shame the format wastes half the space available with pointless and rather childish illustrations that don't add anything at all to the content. This book is supposed to be aimed at adults, but I read this on a train (the format's ideal for a short journey), and felt embarrassed to be seen looking at what appears to be a children's picture book. Occasionally, the tightness of space of the format led to an oversimplification that was confusing. So, for example, when talking about the travelling salesman problem, we are told: ‘The best we seem able to do with NP-complete problems [never properly defined] is to exhaustively consider all possible solutions.’ But it depends what you mean by best. That's the only way to be sure of finding the optimal solution, but there are methods that will get within a small percentage of optimal in practical times (or satnavs wouldn’t work), which are surely better than a non-feasible approach? Similarly, we are told ‘The type of logic used in mathematics can’t cope with this seemingly trivial scenario [moving away from the idea Tweetie, who is a bird, can fly when you discover it’s a penguin], because it wasn’t designed for retracting conclusions.’ But this is exactly what happens when using Bayesian methods... which bizarrely are covered on the next page. A final, and important oversimplification is over the negatives of AI. Some parts ignore this. The section on driverless cars is upbeat about all the lives that could potentially be saved. But this ignores the psychological issue that we aren't good at weighing up virtual lives saved against the actual people who will definitely be killed by driverless cars (the first example occurred just before this review was written). Though Wooldridge does mention problems from job losses, loss of privacy and algorithmic bias, he also misses the negatives arising from a point he makes earlier that machine learning can’t explain its decisions. The inability to explain why, say, someone is refused a mortgage runs counter to increasing move towards corporate transparency and could prove a real problem. Overall, Wooldridge does a surprisingly good job, though, given the limitations of the format.